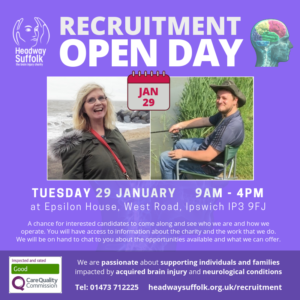 We are holding a Recruitment Open Day on Tuesday 29 January from 9am – 4pm at our Ipswich hub at Epsilon House, West Road, Ransomes Europark, Ipswich IP3 9FJ. It is a chance for interested candidates to come along and see who we are and how we operate. You will have access to information about the charity and the work that we do. We will be on hand to chat to you about the opportunities available and what we can offer. For more information and an informal chat, telephone Penny Tansley on 01473 712225, 01473 552868 (direct dial) or email: pennytansley@headwaysuffolk.org.uk. You can find out more about our jobs on our recruitment page and our jobs page on Facebook.